A tag team birther workers and postpartum specialists bound in sisterhood to support the many transitions of parenthood. Kimberly Durdin is a Los Angeles based Lactation consultant (IBCLC), Student Midwife, Childbirth Educator and Doula. As a mother of six and grandmother of three, Kimberly credits her children as her greatest teachers. Allegra Hill is a forever Los Angelino currently living in Culver city with her husband Gerry and daughter Dorothy. She serves families as a home birth midwife, Doula/monitrice, lactation consultant, group leader and placenta encapsulator. Allegra attended the National Midwifery Institute where she graduated and completed her licensure in 2014. She has extensive knowledge and training in nonviolent communication, conflict resolution and early child development. It is her honor to support families as they make, grow, birth and nourish their children with confidence and support. Luree Nicholson, CCHt, MH, Is a Medical hypnotherapist specializing in fertility, pregnancy, childbirth and post-partum. She has has guided births in both home and hospital for over 20 years. Luree is the creator of the “Birth Hypnosis Method” considered by most OBs, midwives, nurses and Doulas to be the most effective hypnosis for birth program in the LA area. Khefri Riley CLEC, CPYT, CD is a Women’s Mysteries Mentor, Birth, Baby, Prenatal Yoga Specialist and Ordained Minister. 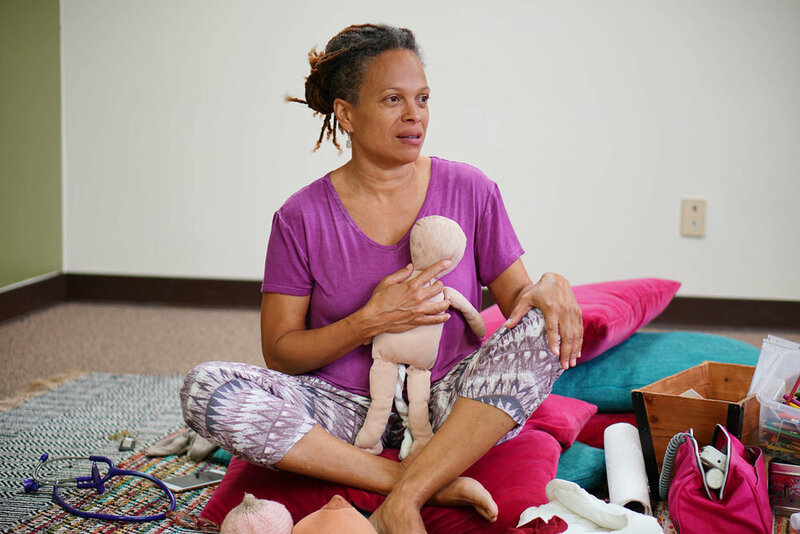 She delights in sharing her 16 years of experience as a women’s yoga teacher, certified prenatal kundalini yoga teacher, certified lactation educator counselor, certified birth and postpartum doula, certified kids yoga teacher, infant care specialist and childbirth educator. Dancing Moon is a wife and mother of two who has loved to dance since she was a toddler. She supports moms primarily during the endless years postpartum with holistic life coaching, dance, and vaginal steam services. She is honored to meet you exactly where you are on your parenting journey.